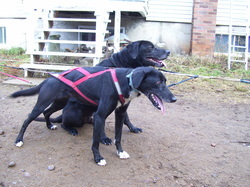 Venus is a very affectionate dog, easy to harness and a tempest when hooked up at lead! 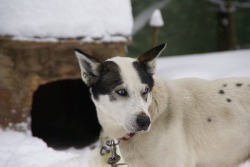 She is a real sweetheart in the kennel loving attention and a real spirited, focussed leader in the team. She is a real treat to run. Many thanks to Rosaire for adding her to my kennel. 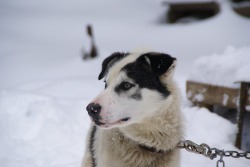 Kira is a two year old leader from the kennel of Laurent Gonsolin. She was bred in France and her father was the same sire as Indy. She is a beautiful dog that is very serious and focused leader. She got some race experience last season with Laurent. Kira will be the main Open Class race leader here this season and the future main Leader of my team. 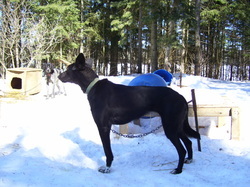 Roxie is 51/2 year old experienced leader from the kennel of Rejean Therrien. 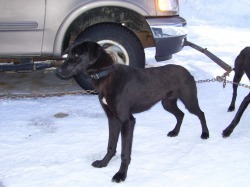 She was bred at the kennel of Eddy Streeper in Minnesota. Roxie is a very quiet dog in the kennel that loves attention when she gets to know you. 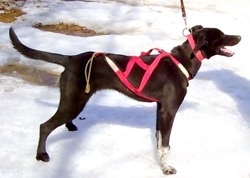 However, when in harness and at lead, she becomes very enthusiastic to run. 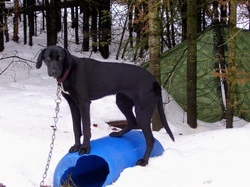 She is a very confident Alpha leader and just what is required here to support the young leaders in the kennel. With her race experience she will be a big asset in passing other teams and handling the pressure of spectators. Lena is a very serious female who can run anywhere in the team. She will get some experience at lead this year to see if she has some aptitude for that position. She is a terrific Wheel Dog & ran all season 2013 in Laurent Gonsolin's championship 8 dog team. 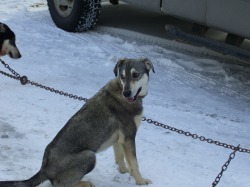 Fille is the sister of Blue & like her brother a very enthusiastic, hard worker. She will run anywhere in the team & has had a little experience at lead. She is very affectionate & loves attention. Bergen is a two & half year old Race Leader. She is very affectionate but very focused when at Lead. She is an extremely confident Leader & works well with any co-leader. Her lineage is on the Pedigree Page. She has had one litter of puppies & half of the litter, so far, runs lead. She is from the kennel of Valerie & Laurent Gonsolin. Perle is an 18 month old female with a very affectionate personality. She is the daughter of Tok (E.Ellis)/Matisse (daughter of Carter -T.Streeper). Perle can run in any position with confidence, enthusiasm & ran great Point with Indigo. She will get lead experience next season with the hope for her to run co-lead with Indigo. Halona is Miss Congeniality of the litter. She never misses an opportunity to get attention. 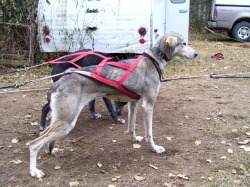 Like her sister, Hurit, she was a little slower to adapt to pulling in harness. However, once she learned what was expected, she developed rapidly. Probably due to the attention she knew she would receive after the training run. 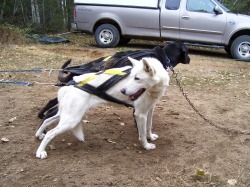 Like her litter mates, she is also strong & serious when pulling in harness. She is very playful in the kennel & will jump up into your arms unprompted. Photo taken at 9 months of age. Hurit was the smallest of the pups. But, has grown to the same size as her sister Halona. She was shy as a pup and due to her size quickly learned to look after herself. She is a little more serious in harness than her sister. 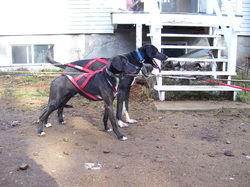 However, they were both a little slower adapting to the harness/pulling work than their brothers. But now they are catching up to them with their work ethic. Hurit loves attention & gets excited when someone comes to see her. She has the build more like Cobalt. Again, this photo is of her at 9 months old. Hok'ee is the other male that I kept. 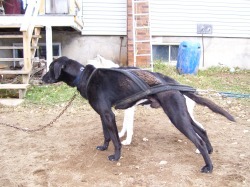 He is a little more reserved than Hinto but equally well adapted to working in harness. 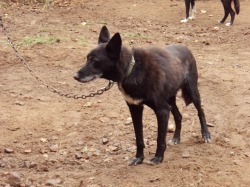 He is an enthusiastic puller & like Hinto a very strong dog. At this stage I see him being more adapted to a position in the team or Wheel. He loves attention and is always excited for interaction with me or his neighbors in the kennel. As a pup, he was a little more reserved but when his other three litter mates went to Rosaires kennel, he came out of his shell. Here as well the photo is of him at 9 months old. Hinto is a very confident dog that I feel has the potential to be a Lead Dog. 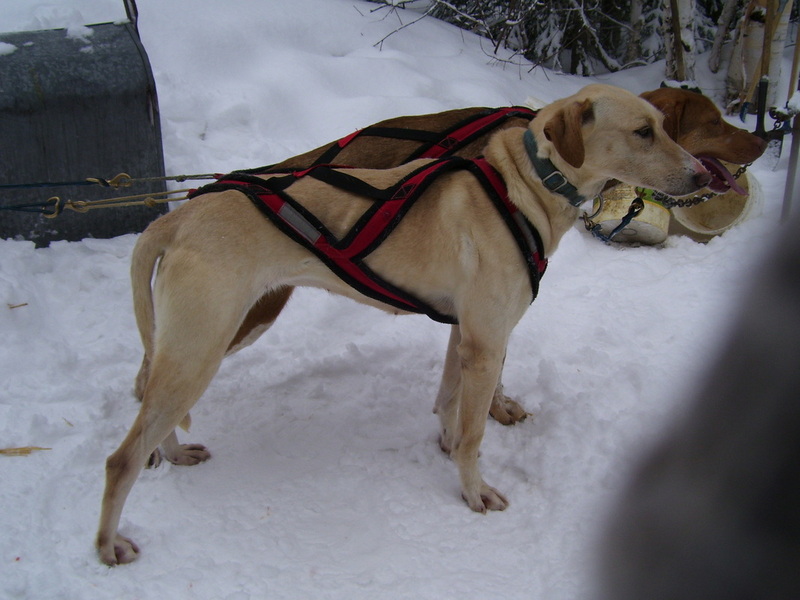 He is strong and has no problem in harness & truly enjoys running. 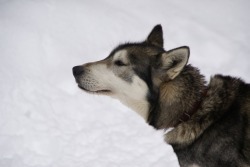 He is always the first of his litter mates to perform a task & learn something new. When in harness, he is all business. In the kennel, a real pet. As a pup, he would come up first to get my attention & then lay down & sleep while his litter mates were playing around. The photo here is at 9 months of age. Born June 25th, 2011. Father Tony & Mother Cobalt. 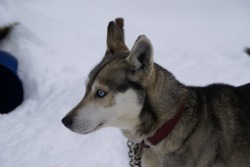 Angel is 4 years old and also run on the Open Class Team of Rosaire Perron for the 2009,10, & 11 Racing Seasons. Angel will run in any position in the team, including lead. She is a little shy, but quickly adapted to her new surroundings. She is one of my main leaders for the 2011/12 Season. Tanya is 4 years old and ran on the Open Class Sprint Team of Rosaire Perron for the 2009,10 & 11 Racing Seasons. 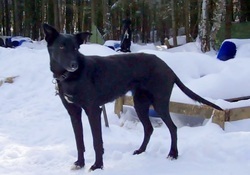 She is a very friendly dog and will run anywhere in the team with the exception of Lead. She is excellent at Point. Tony is 8 years old and raced for Claude Bellerive & Rosaire Perron here in Quebec. He has also sired many offspring's that are on top competitive Open Class Teams here in Quebec. 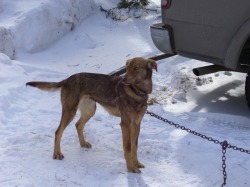 Tony came here from the kennel of Rosaire Perron and will be used here as a stud & to help train the young dogs. Tony is a son of Mike from Egil Ellis. 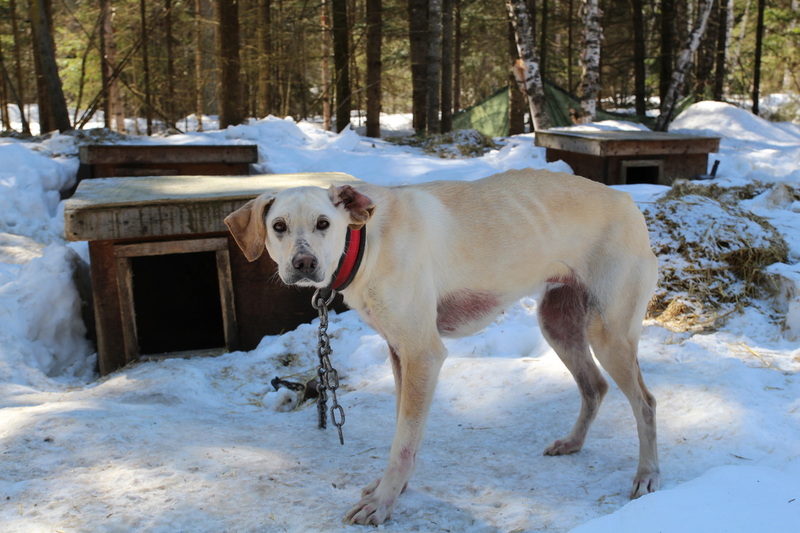 Tony is a very friendly dog who especially likes his house, food, attention & the females. Not necessary in that order. Max is a 4 year old experienced race leader. He is an enthusiastic, speedy and focused when in the team. In the kennel, he is very friendly and loves attention. 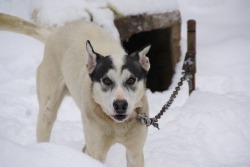 He was from the kennel of Rosaire Perron. 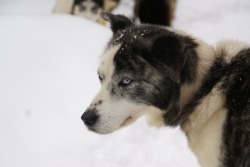 His father is Captain (Eddy Streeper breeding & Eddy's main leader @ the North American Open Class Sled Dog Race in Fairbanks, Alaska). 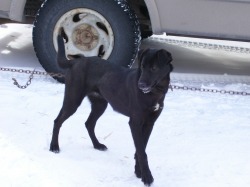 Indigo is a happy, energetic 9 month old female. Blue is a happy friendly 11 month old who loves people and attention. He is a quick learner and a real charactor. 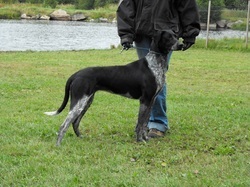 Cobalt is another smallish speedy female with a great work attitude. Her mother is Visa ( Egil Ellis) and her father is Brandy ( Serge Pomerleau). She started running Lead the 2011/12 Season & is doing a great job. Came from kennel of Serge Pomerleau. 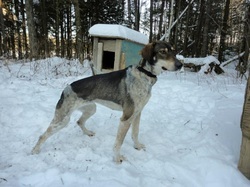 Teal is a smale female with a big attitude and perforemance to match. Dont let she size fool you , she is all go & a potential leader. 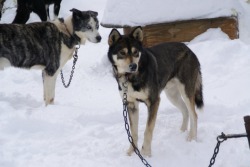 Her mother is Enis (Laurent Gonsolin) and her father is Brandy ( leader-Serge Pomerleau). 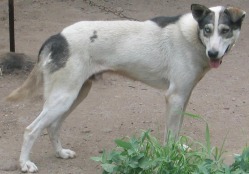 Cosmos is the brother of Goliate, a Blackie/Tira breeding. He is a very strong dog but also has a very gentile nature. He is a little shy and doesn't easily give his trust until you earn it. Goliate is french for Goliath. Goliate is a good name for him as he is a big male. 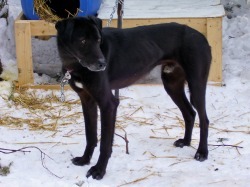 He is a Blackie son and his mother is Tira (Serge Pomerleau). He is a little shy , but a very gentle, friendly dog when he gets to know you. Annie likes to destroy the roofs of her house. Yes, she has destroyed more than one. However, that phase seems to have come to an end. Like all her litter mates,she loves attention and interaction with her neighbours. She is a real sweetheart. Katie is still the instigater of the group. She loves to be in the middle of all the action. But, when she wants to relax, she likes to lay next to her brother Nicky. Like her litter mates, she also loves attention. Lizzy is the character of the group. She loves to get in mischief. Her and Willy have a contest every meal to see who can finish first and she wins her share of the competitions. She likes her one on one time; but, has a hard time standing still long enough to get much. She is definitly not shy! Nicky is also a very friendly dog. However, he is more laid back and more inquisitive. He loves attention and especially likes the comfort of sleeping close to his sister Katie. He definitely has a closer relationship with her over the other pups in his litter. He likes to play with his litter mates. But, at the same time he can be more of a loner. Sophie is the biggest female of her litter. She the same size as her brother Nicky. She is very exciteable, especially when she gets her one on one time. She just cant stand still. Vicky is the guardian of the group. She is very inquisitive and always alert to changes. She is a little more independant and likes to be the boss. She is more rebellious and will try to get her own way. She can be a little shy with strangers. But, she also likes attention when she warms up to you. Willy is so far the biggest of his litter and goes crazy for attention. However, when he jumps up on you , he is very gentle and placid. Like all the pups he loves his one on one time with me. He is a good eater and lets nothing distract him while eating. 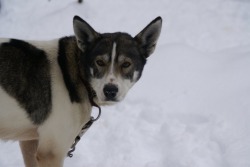 Willy started running @ Lead 2011/12 Season. He is very fast & enthusiastic at the Lead position. BACKIE is also a new addition to the Miortuk Team. 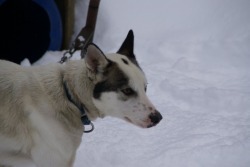 He is also from the Kennel of Rosaire Perron and ran on his Open Class Sprint Team the last couple of years. 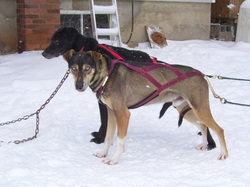 Backie is from the Egil Ellis, Eurohound Sprint Lines. He is also very fast, strong and a very eager worker in the team. He is 60# male and very friendly with everybody. He is a dog that wishes to please. He was bred to Cannelle this Spring. CANNELLE is a new addition to the Miortuk Team. 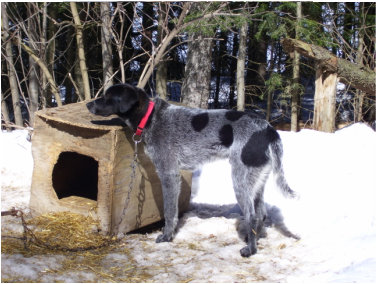 She is from the Kennel of Rosaire Perron. She is from sprint lines of Sanderson, Ellis and ran on Rosaires Open Class Sprint Team the last couple of years. 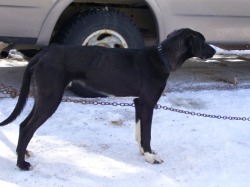 She is a very finely built female weighing around 40#. She is very fast and has an enthusiastic attitude for running. She is a little timid in the kennel with humans. But, when she gets to know you , she is a real sweetheart. 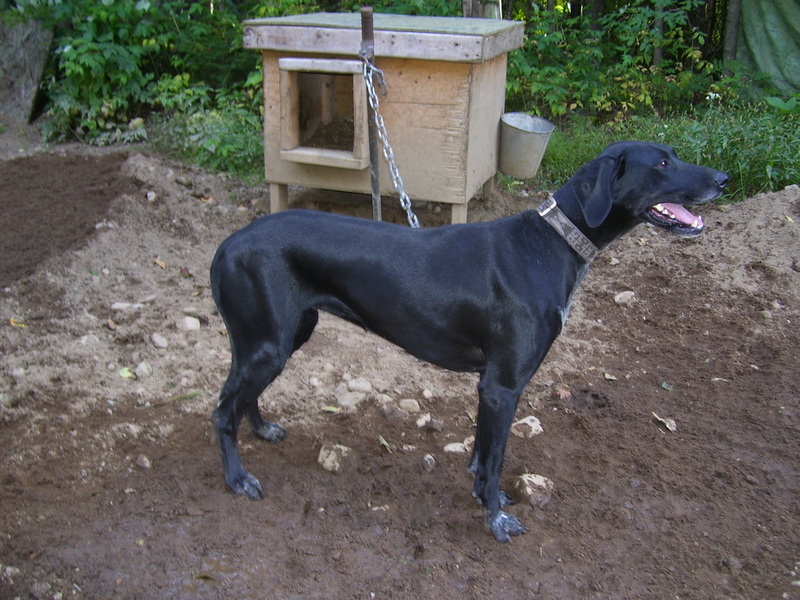 She was bred to Blackie and is expecting a litter in May 2009.
" 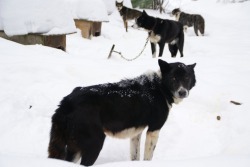 ALL OF THE FOLLOWING DOGS ARE NO LONGER AT MIORTUK KENNEL"
RIGLIS is one of the most lovable females in the kennel. She is very affectionate with anyone willing to spend time with her. She is also a great runner as well. She will run lead and anywhere else in the team. She is a very fast leader, however, she is a slow starter and needs about a1/4 mile to warm up. But when she warms up, she flies! Riglis, for as friendly as she is, she doesn't like crowds and not a good candidate to put at lead at the start of a race. APACHE is a real success story. 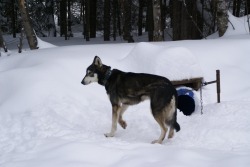 I brought Apache to my kennel when another musher was getting out of dogs. He was very shy and didn't trust anyone. It took almost a week before he would eat for me after arriving here. I spent a lot of time just sitting in his area before he would to come to me. We ended up with a very close bond and he has never let me down in the team. He will run anywhere in the team. He was always the dog that I would put up with Aurora at the start of a race. His distrust of strangers made him a good candidate to get us out of town especially at Fort Kent where the race starts in the center of the village running down the main street that is lined (on both sides of the start line ) by several thousand spectators. He is very fast and durable. He is very slow to warm up to newcomers in the kennel. When let loose in the kennel, he loves to visit all the females. BUTCH is the brother of Clyde. He is an extremely dependable, tough, hard worker. He has never been dropped in a race and is always performing right to the end. He is one of the best Wheel dogs that I have ever had the pleasure to run with. Butch will run anywhere in the team including Lead. 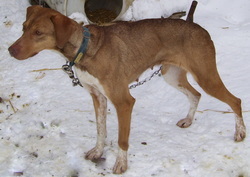 Butch is a 6o# male, but he is very light on his feet. He is so dependable, that I almost forget he is in the team. Butch is the spiting image of his father Malik. Butch is very friendly and loves the attention from all visitors. POLARIS is a good 55# male and the brother of Star. Both him and his sister are from Joee Redington breeding's. 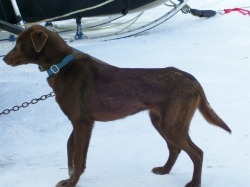 He is a smooth, fast, hard working dog with plenty of desire to run. He is a very easy keeper and loves attention from anyone willing to supply it. He is the sire of Nancy, Minnie, Charlie, Casper, Elmer, Lynus and Mickey. STAR is an average size female with solid determination. Most times her determination is fine,however if she gets her mind on doing something it is hard to alter. She is very intelligent and if something ,to her, doesn't make sense , then she will balk at doing it. This is only a problem if she is at lead. She is best running in a team position. She was a dog that lacked confidence when she was young. But, that all changed when she got older and is now a very hard working dog. She is the mother of Stormy, Sky, Lightning and Thunder. She can be a little reserved with strangers. MICKEY is also a very fast , smooth dog. He is perpetual motion in the kennel. He is a dog that can run longer runs without any problem due to his smooth gait. Last season, he came into his own and finally gained the confidence he lacked in a team setting. He runs best in a team position or wheel. He is very affectionate with me. LYNUS is another very good male. He will run anywhere in the team including Lead. However, he excels at Point. He is a little standoffish with strangers in the kennel. However, if he gets to know you, he is very affectionate. CHARLIE is one of the smoothest movers in the kennel. He is fast and no trouble in the team. However, he is slow to mature and has not yet reached his potential. He has a confidence problem, when he is comfortable runs great. It is very important find the right dog to pair him with in the team. He has run lead with Clyde training the puppy team. Charlie is the sire of Stormy, Sky, Lightning and Thunder ( an exceptionally good litter ). STORMY is female equivalent to ELMER. 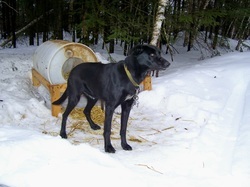 She is one of the youngest females in the kennel and one of the most cocky. She is extremely fast and very impatient when we stop. She is a spark plug in the team, exciting the rest of the team to go. She ran an Open Class Sprint race in her yearling year. She is very confident in herself and her abilities. She is friendly with anybody visiting the kennel. 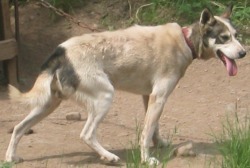 She is feisty with other females in the kennel displaying her Alpha attitude (exception CANNELLE, her closest female neighbor ). She has had a brief stint at lead and shows potential for that position in the future. Her mother is STAR and her father is CHARLIE. ELMER is the rebel of the kennel. If there is ever a commotion going on , he is probably in the middle of it. He is very standoffish with outsiders and is only affectionate with me. He is the definite Alpha dog of his litter. He is cocky and with confidence to spare. Lead or Point is his prefered poitions in the team. But he will run with enthusiam anywhere in the team. He will probably be my next supper star male leader. This next season, he will get a lot of running time in the lead poition. He is fast and likes to run fast. He is not a big male, probably weighing in around 45#. But dont let his size fool you, as he is very strong. He is truely a real character and for me a real fun dog. NANCY is a very friendly dog. Like her sister, she is also petite. She will run anywhere in the team but she excels at Lead & Point. She has very easy going personality and that makes it easy to run her in combination with any team mate. She has a great attitude in harness with a strong desire to please. Nothing stresses her and she always gives you her best. She is one of the sweet hearts of the kennel. MINNIE is a small female with a big attitude and a lot of confidence. She loves running at the front of the team at either lead or point. 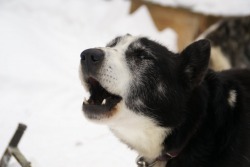 She will also bark at her team mates, if she feels they are not running fast enough for her. Minnie is always eager to run and likes attention from everyone that enters the kennel. She is a dominate female and demands respect from her fellow team mates. She is from a litter for 7 mothered by Amorook and sired by Polaris. This litter has provided a high number of top athletes. She was born May 2006. Litter mates Nancy, Elmer, Charlie, Lynus, Casper and Micky. COYUTE is a very reserved dog, she is very affectionate with me but very leary of strangers. She was a dog that was slow to mature , as far as her confidence in team running. However, that has all changed and she will run anywhere in the team including lead. 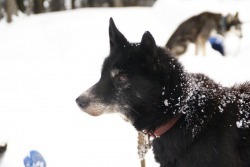 She is now a top performer and is proof that patience is required when training sled dogs. She has a great desire to please me and it shows with every run. She enjoys running fast and did a great job at the Wheel position last year. She , like all her litter mates are very low matenence ( good eaters, good feet etc. ). She is a real pleasure to spend quality time with. Born Fall 2004. 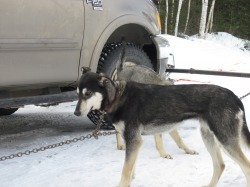 NANOOK is also a leader and she is not intimidated by other distractions on the trail. She is confident at passing other teams both head on and overtaking. She also loves to run fast and makes an awesome duo with Leo. She is very affectionate with me, but standoffish with strangers. She will run anywhere in the team with the same enthusiasm she has at lead. The only exception is the point Position, as her desire to run can intimidate other female leaders. If the team is not going fast enough for her, she barks at them to go faster. She is a real pleasure to run. LEO is the new supper star in the kennel. He has turned out to be a supper Gee/Haw leader. He always runs with great enthusiasm and desire to please. He is very fast and easily sets the speed for the team. He will run with any other female leader. 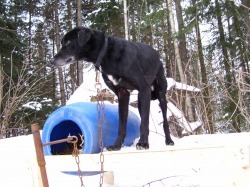 Around the kennel, he is very reclusive with strangers usually staying in his house observing their movements. 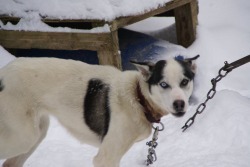 He was born in the Fall of 2004 and is a litter mate to Amorook, Coyute and Nanook. All of that litter are leaders. CLYDE is one of my main dogs in the kennel. He has a standoffish attitude with strangers, but is very affectionate when gets to know you. He can run anywhere in the team from lead to wheel and is always enthusiastic to run. Clyde was born in the Fall of 2002. CASPER is a little independent around strangers, but is very devoted to me. Like all young males he is cocky around other males in the kennel. He is a very fast, hard working dog who is just learning how to pace himself on longer runs. He has run at every position in the team with the exception of lead. He was born in May 2006. She is the mother of Casper, Charlie, Elmer, Lynus, Mickey, Minnie and Nancy. 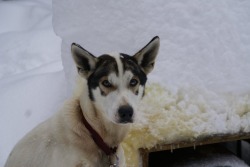 AURORA is the matriarch of the kennel. She is a natural leader and started running lead at 6 months of age. Until recently, she didn't want to run at any other position. She lead my race team for 10 years and is a perfect GEE/HAW Leader( Gee = right turn, Haw = left turn). She was responsible for training all my current leaders. 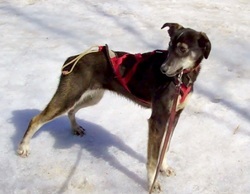 She ran lead in Fall training last in 2008. 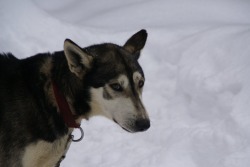 She is now retired and comes in the chalet every night to a nice warm, comfortable bed. So far, she has been the best Leader I have ever had. Aurora was born in the Spring of 1995 in Brampton, Ontario before I moved to Quebec. When she walks loose in the kennel, she still gets respect from all the other dogs.